Distributors in the cleaning and hygiene sector gathered at a recent event held in the West Midlands to get answers to their questions on the implications of the REACH regulation. 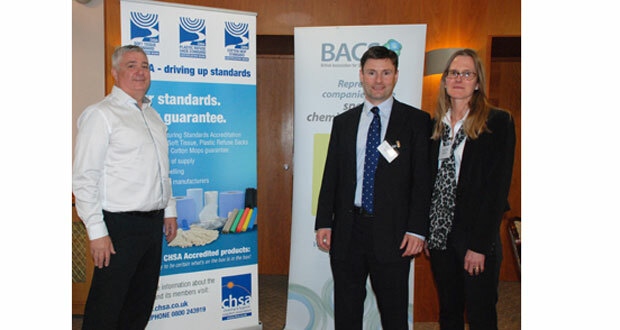 To help businesses in the sector adapt and respond, the Cleaning & Hygiene Suppliers Association (CHSA) and the British Association for Chemical Specialities (BACS) hosted the “REACH for the cleaning supply chain” conference. BACS brought together a team of expert speakers able to outline the issues and answer questions from the delegates. The thorny issues of dealing with private branding and contract packing were addressed, with Robin Foster of the Health & Safety Executive (head of policy, International Chemicals Unit, HSE) explaining that as an ex-inspector his first port of call would always be to the company on the product label. Another complex area in the industry is that the products which are traded are not necessarily those that are used. For instance, concentrates can be dosed into bottles fitted with spray heads. The REACH specific information, which may not be on the safety data sheet, helps the users deal with their COSHH obligations for these products. Martina Williams, who has 25 years’ experience working for multinational chemical companies and is one of BACS’ regulatory affairs consultants, outlined distributors’ responsibilities and the deadlines to be met. Simon Bradshaw, director of Lisam Systems and a specialist in the provision of chemical labelling solutions, provided a presentation on safety data sheets. And, Robin Foster gave a thought provoking talk on the future of managing chemicals and the action being taken in Britain and at EU level to substantially reduce work related cancers which currently vastly outnumber accidental work related fatalities.